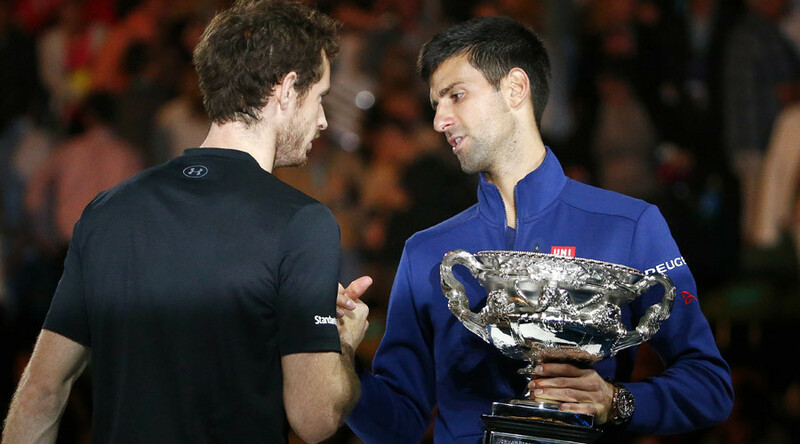 Novak Djokovic secured his sixth Australian Open title with a straight sets victory over world #2 Andy Murray. Djokovic, who beat Roger Federer in the semis, put in a masterful performance that ended with an ace in a third set tiebreak. It is the 11th Grand Slam singles title of the Serbian’s career as he retained the Australian Open title he won last year. He continues to hold three of the four Grand Slam titles, with only the French Open eluding him. Djokovic survived a break point in the opening game of the match and then rattled through five straight games to eventually win the opening set 6-1 in just 23 minutes. It was hardly the start that Murray, appearing in his fifth Australian Open final against Djokovic, would have wanted. But the Briton fought back in the second set to steady the ship, and it went with serve until 3-3 when Djokovic pounced on an opportunity to break, laid on by a starting double fault by Murray. Murray responded, however, earning his first break point since that opening game and coming through to tie the second set at 4-4 despite a challenge from the Serbian, which was thrown out. That then enabled Murray to serve his way to within one game of the second set, and at 15-30 he was just two points away from the set. Djokovic pulled back though and then dealt a killer blow, breaking Murray’s next service game and then clinching the second set 7-5 as Murray continued to make errors. The Serbian was in imperious form, and at 3-0 up in the third set it looked like the match was heading for an early finish. But Murray dug his heels in to reel off four straight games to lead 4-3 and then 5-4, but you never felt that Djokovic was capable of failing on a decisive point. The set headed for a tie break, and Murray got off to an awful start with two double faults, and that enabled Djokovic to build up five Championship points and he duly took them after a couple of attempts to win the third set tie break 7-3. A sixth title means that Djokovic equals Roy Emerson’s record for the most Australian Open titles, and continues his hoodoo over Murray who loses in the showpiece at the Rod Laver Arena for the fifth time in the last seven years. "I feel like I've been here before. Congrats Novak. Six Australian Opens is an incredible feat. The last year has been incredible. Good job. "I'd like to thank my team for getting me to this position. Sorry I couldn't get it done. Thanks for all your support during a tough few weeks off court. The final word, though, was left to Djokovic who was typically gracious in victory, paying tribute to his opponent. He said: "I need to pay respect to Andy for having another great tournament. Tough luck tonight. He's a great champion, great friend and a great professional who I'm sure will have many more chances to win this trophy. "I also wish you and Kim good luck for the birth of your child and I hope you will experience a feeling like no other before - that's what happened to me and my wife. I wish you all the best. "I'm extremely honoured to be mentioned alongside the legends of our sport like Mr Rod Laver. It's also a great honour to equal the record to one of the greatest players to have ever played this game [Roy Emerson]."